Fish - what's your take on it? I happen to like it, but my better half isn't necessarily a fan. Since we're in "healthy living mode," I brought up the idea of incorporating fish dishes back in our meal routine. Only this time, he was more open to trying fish again. With that, I've been thinking of various fish dishes to try and wanted something comforting, yet healthier. 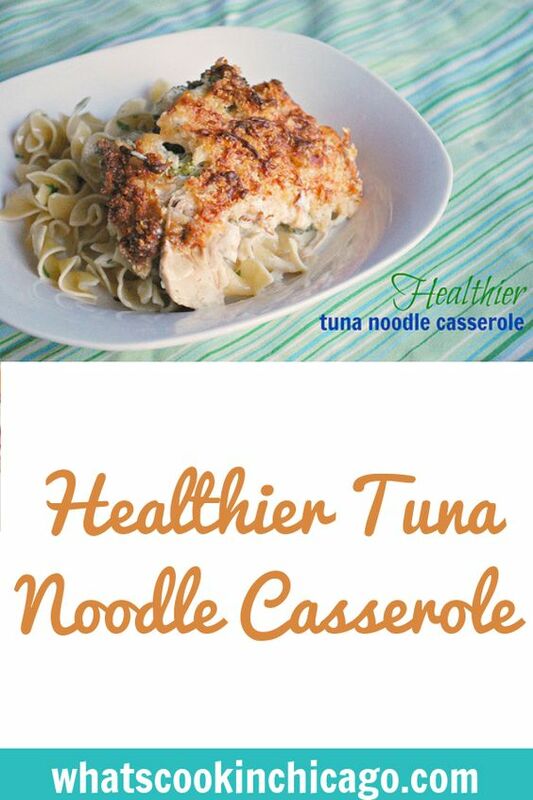 So, I found this lightened up version for Tuna Noodle Casserole. 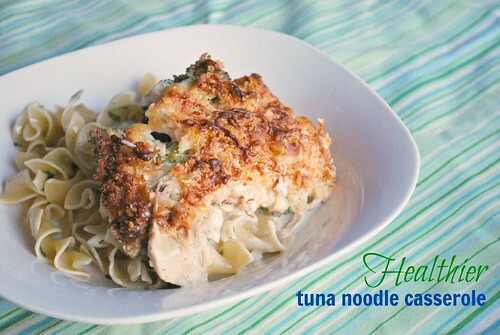 Comforting, warm and pretty guilt free with egg noodles and a blend of vegetables, cream cheese, Parmigiano Reggiano and tuna, topped with buttery Parmesan breadcrumbs.. Using light cream cheese and Parmigiano Reggiano, this dish saved quite a bit of calories while keeping that warm, comforting goodness. If you don't like fish or tuna, no worries - substitute the canned tuna for shredded or diced chicken breast! Heat a large skillet over medium heat. Add oil to pan; swirl to coat. Add onion and carrot; cook 6 minutes or until carrot is almost tender, stirring occasionally. Sprinkle with flour; cook 1 minute, stirring constantly. Gradually stir in milk; cook 5 minutes, stirring constantly with a whisk until slightly thick. Stir in cream cheese, mustard, salt, and pepper; cook 2 minutes, stirring constantly. Remove pan from heat. Stir in noodles, peas, 1/4 cup Parmigiano-Reggiano cheese, and tuna. Spoon mixture into a shallow broiler-safe 2-quart baking dish coated with cooking spray. Combine the butter, remaining 1/4 cup Parmigiano-Reggiano cheese and breadcrumbs, then sprinkle on top of casserole. Bake in preheated oven for 30 minutes or until golden and bubbly. Let stand 5 minutes before serving.